Resistance training (exercising with appropriate weights) should certainly be part of a balanced workout program. And when we talk about weight or resistance training, we’re not talking about trying to give you Arnie Arms! Our aim with resistance training is to help you improve strength and build lean muscle mass (which can help to give you shape and tone). You may also have heard that lean muscle mass actually helps you to burn more calories throughout the day, which is another handy benefit. When it comes to resistance training, in order to get the best possible results, it’s very important to select the correct weight for any given exercise that your Fitness Coach provides for you. If you’ve been a member of your gym or fitness club for quite some time, have a think back about what size weight you were using 6-8 weeks ago for a given exercise… Are you still using the same weight today? If so, you may well be working out inefficiently. You see, a major key to results from resistance training is selecting the correct weight. For example, if your Coach prescribes you with 20 Dumbbell Chest Press, an appropriate weight should see you reach a maximum of 22 reps, and a minimum of 18 reps. If you get to 22 reps and still could have performed more, then this indicates that your weight was too light and you could consider increasing the weight for your next set of repetitions. If you couldn’t make 18 repetitions, then your weight was too heavy and you should select a lighter weight for the next round of lifting. At the end of the day, your Fitness Coach has prescribed a certain number of repetitions because there is a specific fitness outcome to be gained. Choosing an optimal weight for each exercise will help you to achieve the intended outcome. 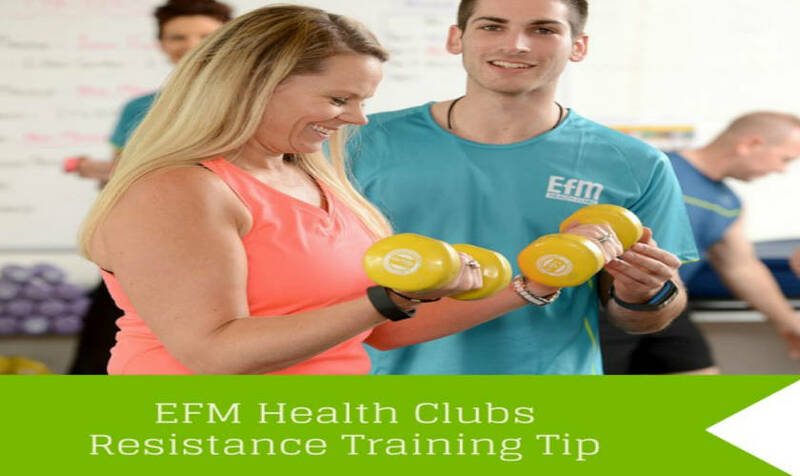 And of course, your EFM Fitness Coach is always there to help you through your program so before you pickup your next weight for a resistance exercise, sing out to your Coach and ask them for a suggested starting weight and use the rule of 10% from there.